Sign in: I have multiple 37signals IDs. Can I merge them together? If you have multiple IDs across different accounts, you can easily merge them together. You’ll have a single sign-on for all your accounts. This process won’t work for multiple IDs in the same account. Step 1: Log into the account that has the ID you don’t want to use anymore. Then click the “My Info” link in the top right corner. Step 2. Click the “Edit your personal information” link. Step 3. Click the “Use a different 37signals ID” link in the top right corner of the light blue “Update your 37signals ID details” header. Step 4. 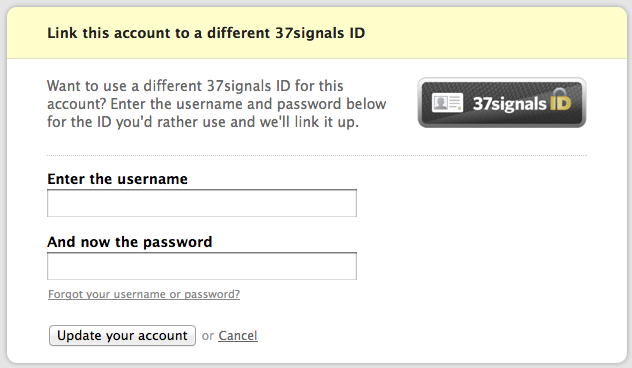 Enter the username and password for the 37signals ID (or OpenID) you want to use. Clicking “Update your account” will merge the identity you’re currently using with the identity you want to use. Any accounts that used the old ID will now use the new ID. Note: if you have multiple IDs on a New Basecamp account, please write support to have them merged.